“The Party’s Just Beginning”, Karen’s directorial debut, opens on December 7 in limited release and December 11 on VOD. Watch the official trailer below. Empire: A little more than a year ago, word arrived that Will Smith and Tom Holland would be lending their voices to new Blue Sky animated adventure Spies In Disguise. 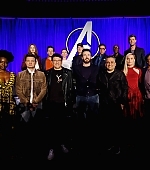 Now we know who will be joining them, as Ben Mendelsohn, Karen Gillan, Rashida Jones, DJ Khaled and Masi Oka have all been announced as in the vocal cast. Then we have Holland’s Walter, who, as you might be able to guess, isn’t exactly on the same level, though he brings his own talents to the table. What he lacks in social skills, he makes up for in smarts, being the genius brain behind Sterling’s gadgets. But when events take an unexpected turn, the pair has to rely on each other in a new way. There are no details on what the new cast will be bringing to the film, though we wonder whether Mendelsohn will once again be dipping into the Bad Guy bag, or if he’ll be a fellow hero. Epic’s Nick Bruno and Ferdinand storyboard artist Troy Quane are sharing the directorial chores, with the film based on Lucas Martell’s short animated film Pigeon: Impossible (you can see it at this link). Spies In Disguise has shifted its release date, and will now arrive on 13 September next year. 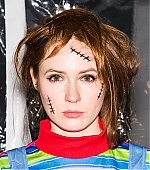 Back on Saturday (October 27), Karen celebrated Halloween dressed up as Chucky as she attended film director M. Night Shyamalan’s Halloween party ‘Shyamaween’ in Philadelphia, Pennsylvania. High-quality images have been added to our gallery. Last night (October 26), Karen attended the 27th Philadelphia Film Festival Closing Night Awards Ceremony at Philadelphia Film Center in Philadelphia, Pennsylvania. 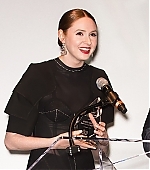 She was awarded with the Artistic Achievement in Independent Film Award for her directorial debut, The Party’s Just Beginning. High-quality images have been added to our gallery. Back on Thursday (October 08), Karen attended the 2018 Downtown Los Angeles Film Festival to reveal her newest film “All Creatures Here Below” to a live audience for the first time. High-quality images have been added to our gallery.